Quartz countertops have been all the rage for the past few years. 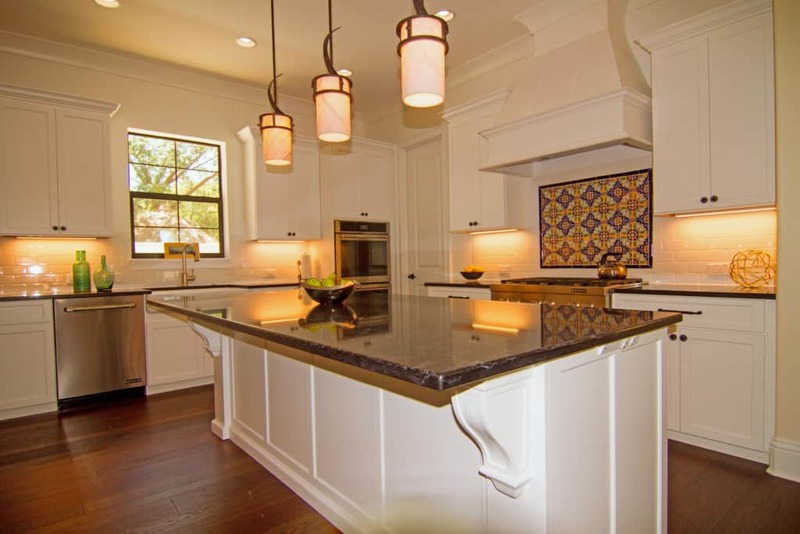 These countertops are fabricated from approximately 93 percent natural stone and 7 percent manmade material. Quartz countertops are created by blending the manmade material with the natural stone using a binder and pigment; the resulting material is then formed into countertops. Because pigment can be added to quartz during the manufacturing process, quartz countertops are available in a wide range of colors and patterns, usually mimicking natural stone. Quartz countertops are also very durable as they are not prone to staining, denting or chipping (although it is not impossible!). While quartz is also considered hard, it is important to not that it is not incredibly heat resistant, as the man-made material within quartz can melt when subjected to heat above 300 degrees. The major perk often associated with quartz is the is the simple maintenance. While it is important to always use cleaners specifically made for your countertops, because quartz is not porous, generally quartz wipes clean with a damp cloth. Granite has been a mainstay in kitchen and bathroom designs for a few decades. Granite is a natural stone formed within the Earth’s crust by cooling and solidifying molten materials. It is available in a wide variety of colors and patterns, dependent upon where the stone was mined. There is an almost limitless selection to choose from and no two granite countertops are the same. Granite countertops are considered quite durable, and although porous, with a proper sealant will resist staining. They are quite hard and heat resistant. It is even a safe option to use outdoors as it will not fade in the sun and can withstand the elements. Quartzite is a natural sandstone within the earth that has been subjected to pressure and heat from tectonic plate compression within the Earth’s crust. The natural stone is mined and then cut into slabs that become a countertop finish. Quartzite is available in shades of white and grey, but yellows and oranges and blues and greens can be found when other mineral traces are found within the slab. Quartzite is also very durable, even harder than granite, and withstands heat well. It is important to use a cutting board with quartzite as it can be scratched, chipped or dented from sharp objects. Quartzite does require maintenance in the form of a professional sealant. Without a proper seal, stains can more easily penetrate into the stone. Etching is also a common occurrence with acidic foods or liquids. It’s important to wipe up spills with a cleaner made for natural stones. Butcher block countertops are a popular option within kitchens, and are fabricated by fusing individual wooden strips together into a slab. Butcher block is not suggested for bathrooms or other wet areas, as wood can gather germs, grow mold, stain, or even warp in shape when exposed to moisture. 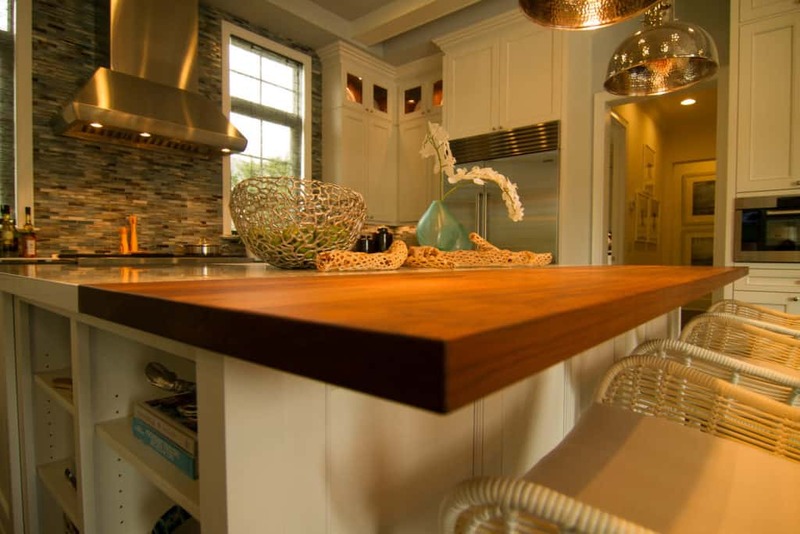 Butcher block is not incredibly durable, as it is prone to nicks, dings and scratches. With that said, butcherblock can be sanded down to remove any imperfections. It is important to seal your butcher countertop finish block monthly. Fortunately, all it takes is one to two coats of food-safe mineral or walnut oil applied with a soft cloth. The marble countertop finish is another 100 percent natural option. Marble is a porous stone that is prone to both staining and etching. Professional sealants will the stone more durable, but will not make it impervious to staining. You will need to repeat the sealing process often, at least twice annually. Because of this, marble is typically a less popular option within kitchens, unless the owners of the home do not cook frequently. With that said, marble can be a great option for bathrooms. When you visit McCabinet, our team will be able to show you many different options to help stylistically guide your choices. We will review the pros and cons of potential materials and advice on what may work best for you and your family. Remember, many materials are virtually indistinguishable with the naked eye, so if you love the look of a certain material, but are unsure if it will work with your lifestyle, make sure to discuss it with your designer. Schedule your design consultation today to take the first step!